With a staggering 300 days of sunshine each year, Namibia is a year-round destination, although some may prefer to avoid the heat of high summer. The cold Benguela current keeps the Atlantic coast of the Namib Desert cool and rain-free for most of the year, with a thick coastal fog that lends a mysterious edge to the area. January and February are the hottest months, when daytime temperatures in the heart of the Namib can exceed 40ºC (104ºF), but nights are usually cool. Winter nights can be fairly cold, but days are generally warm and pleasant. Inland, the rain falls exclusively in summer (November to March). The Caprivi Strip has a unique tropical climate, with heavy rainfall that often leads to flooding between December and March. The weeks following the March rains are ideal for birdwatching, but less good for spotting game, as the animals are more dispersed than in the dry season. The Fish River Canyon hiking route is closed from mid-September to mid-April due to the risk of floods. For travellers seeking a real wildlife experience, the winter months of April and June are the best time to visit, as the bush will be sparser and the dry weather will lead to frequent congregations at the waterhole. Pack light cottons, with slightly heavier cottons or light woollens for evening. Inland, shoes are essential during the day as the ground is very hot. For walking or trekking, ankle-height boots are recommended as there are poisonous snakes in the desert including the Cape Cobra. Neutral colours are recommended for safaris and game viewing. At Sossusvlei, a pair of sunglasses is crucial, as the reflection of the sunlight on the dunes and Dead Vlei is near-blinding. Light cottons, with slightly heavier cottons or light woollens for evening. Inland, shoes are essential during the day as the ground is very hot. Namibia is a large, mostly arid country in southwest Africa with Angola to the north, Botswana to the east, and South Africa to the south. In the northeast corner, the Caprivi Strip, a narrow panhandle of tropical Namibian territory juts towards Victoria Falls, forming borders with Angola, Zambia, Botswana and South Africa. To the west is a 1,280km long stretch (795 miles) of perhaps the loneliest coastline in the world, with foggy shores lashed by the Atlantic and littered with shipwrecks. Along the entire length of the country, the huge shifting dune fields of the Namib Desert spread inland for up to 130km (81 miles). The most stunning sand dunes can be found in Sossusvlei National Park. In the far northwest, the Kaokoland Mountains run parallel to the Skeleton Coast, while further inland lies the Etosha Pan, a dried-out saline lake surrounded by grasslands. 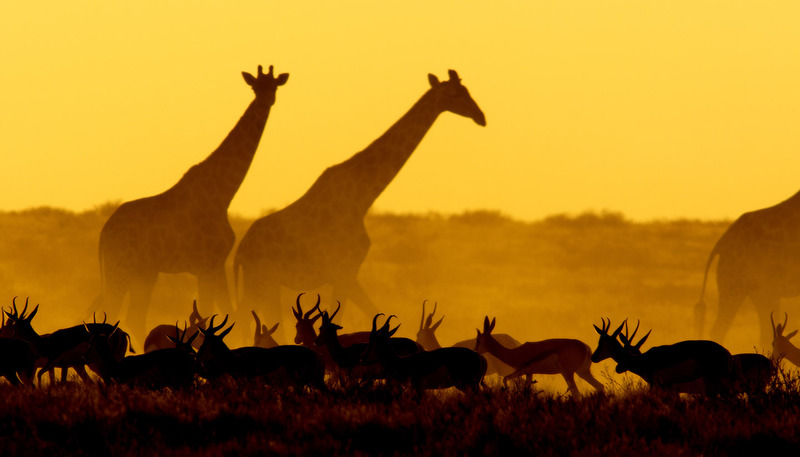 The Etosha National Park is the third largest in Africa, remaining largely free of human influence. In the interior, the Central Plateau runs from north to south, sloping away into the vast sand basin of the Kalahari. Windhoek, the capital, perches on this plateau. The Kalahari has a geography all of its own, with inselbergs, or isolated mountains that create microclimates and habitats for organisms not adapted to life in the desert.